Spring Home issue | Qby. 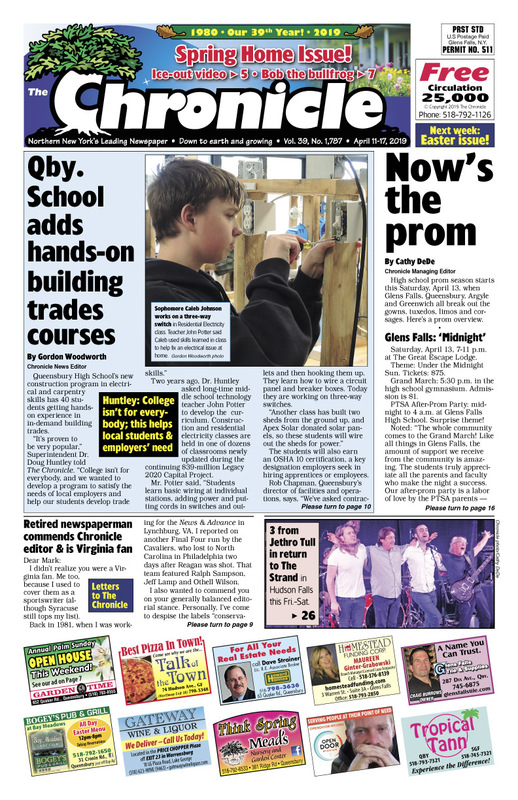 School adds hands-on building trades courses. Now’s the prom. 3 from Jethro Tull in return to The Strand. Common Roots has site for temporary brewery, tap room in SGF; seeks board okay. Saratoga Hospital plans urgent care at former Carl R’s site. Sold-out, upbeat Dancing with the Adk. Stars raises $25,000 for CWI. Jim Fuchs’ dramatic LG ‘ice out’ video rules Internet. Sign of spring? Bob the Bullfrog re-emerges at the Crossroads. Lake George estate sells for a record $5.50-million. Concerts, comedy, shows… The Chronicle always has the region’s best Arts & Entertainment section!